A silver recovery program implemented in the Photography Centre where waste chemicals are pumped through a metallic replacement cartridge, which removes the silver and replaces it with iron, an environmentally safer agent. Working with grOCAD and the Office of Diversity, Equity and Sustainability on special projects such as the Chromafarm window farm that was in Fibre Studio, where plants for natural dyes were grown. 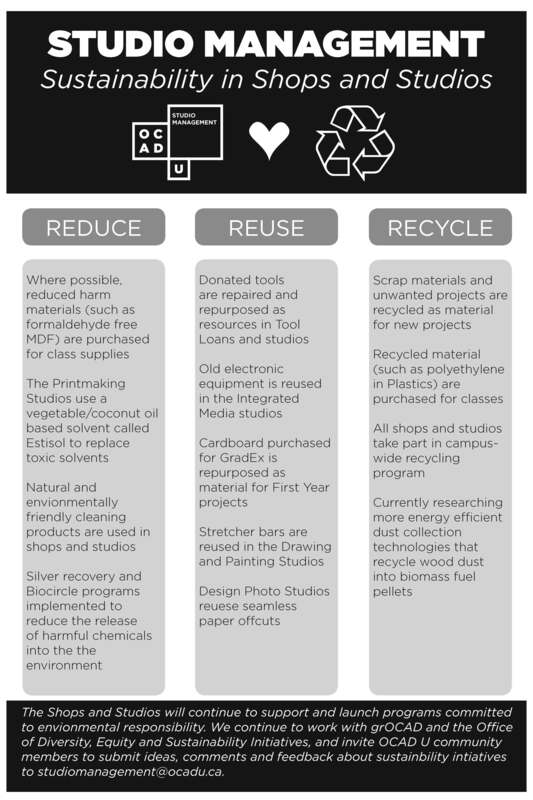 The shops and studios will continue to support and launch programs committed to environmental responsibility, and invite OCAD U community members to submit ideas, comments and feedback about sustainability initiatives to Studio Management.